LED stands for light emitting diode. LED lighting products produce light approximately 90% more efficiently than incandescent light bulbs, and emit much less heat into the living space. How do they work? An electrical current passes through a microchip, which illuminates the tiny light sources we call LEDs and the result is visible light. LEDs produce a pleasing light that is easy on the eyes, similar to incandescent bulbs and much less harsh than compact fluorescent lighting (CFL). Read this article by ENERGY STAR® for an in-depth explanation of LED lighting technology. LEDs provide significant energy savings versus traditional incandescent bulbs and decent increased savings versus CFLs. However, when considering LEDs versus CFLs, it is important to consider the expected useful life of the two types of bulbs. The useful life of LEDs is three times longer than CFLs. Therefore, LEDs are the best long-term investment with regards to cost savings, especially when you factor in the labor needed to install replacement bulbs. 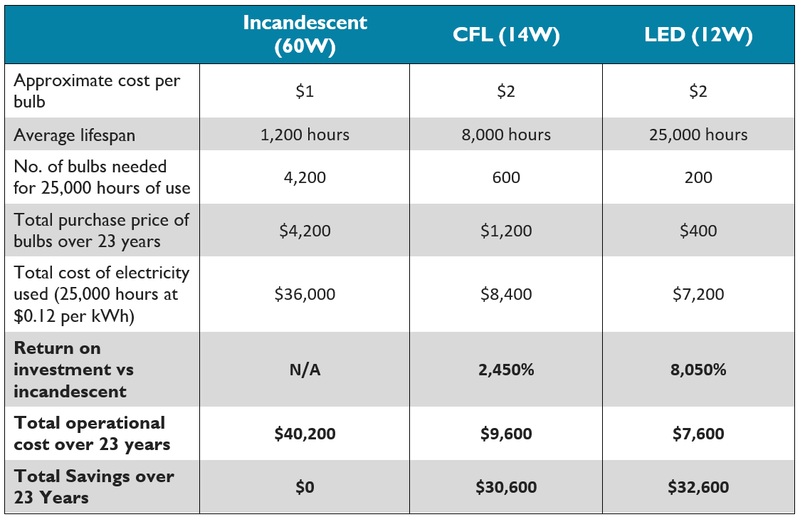 The table below is meant to illustrate cost and energy savings for a 20-unit apartment complex, which, on average, uses 10 light bulbs per unit. CMFNH low-rise participants who install 100% LED lighting, meeting the CEC’s requirements of JA8-2016, receive a 0.5 Delta EDR increase for inland climate zones, and a full 1.0 Delta EDR increase for coastal climate zones. Remember, CMFNH rewards projects that push for deep energy savings, so these additional Delta EDRs can count towards eligibility, or if you project is already eligible, may serve to increase your base incentive. High-rise projects will receive an additional $15 per unit. CMFNH provides additional kickers for high-performance design and installation of other energy efficient features. A reminder, CMFNH does not cap incentives! When you earn multiple kickers on the same project, they can significantly increase your incentive. By installing high-performance measures that exceed building code, it is reasonable for a project to earn up to $200,000 in incentives. Contact us today to find out more.